You’ve never made beef tips quite like this before! Ladies and gentlemen, this here is the easiest beef tips recipe you’ll ever come across! It is also the tastiest. In just 5 ingredients and a crockpot, you’ll have dinner prepped in a few minutes. There’s a very special ingredient in this recipe that isn’t typical of beef tips. Can you guess what it is? Ok, ok, stop twisting my arm. I’ll tell you. LOL GINGER ALE! Yep, the soda pop. You won’t believe how yummy it makes this food. 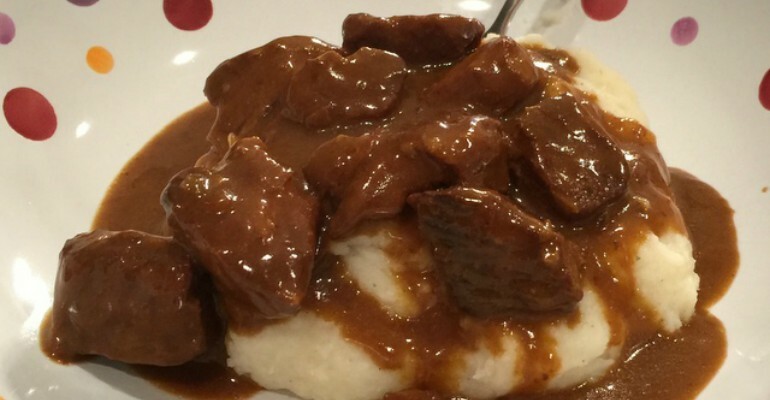 I am so excited that I discovered the Making Memories With Your Kids food blog as that is where I found this amazing recipe for slow cooker beef tips hanging out. Are you ready to learn how to make this marvelous recipe? Wait no longer! Hop on over to the next page and set your sights on the ingredients and instructions. Happy cooking! USE THE RED NEXT PAGE LINK BELOW FOR THE SLOW COOKER BEEF TIPS RECIPE. Quick Tip: Try slow cooker beef tips over mashed potatoes, egg noodles, or rice. Yummo!